Book Review diane arbus: in the beginning By Diane Arbus Reviewed by Blake Andrews Any celebrity who dies at the height of their powers is mythologized, their legacy warped in strange ways as speculation subsumes reality. Such is the price for a life cut short at its creative apex; others are tempted to finish your story for you. diane arbus: in the beginning. By Diane Arbus. Yale University Press, 2016. Photographs by Diane Arbus. Text by Jeff L. Rosenheim. Yale University Press, New Haven, USA, 2016. 240 pp., 130 color and tritone illustrations. Any celebrity who dies at the height of their powers is mythologized, their legacy warped in strange ways as speculation subsumes reality. Such is the price for a life cut short at its creative apex; others are tempted to finish your story for you. James Dean, Janis Joplin, D. Boon, Heath Ledger… Who knows what would've happened? With Diane Arbus — her latter years a whirlwind of exploration, taboo, and originality — the task is especially tantalizing, and maybe that's how she wanted it. "A photograph is a secret about a secret," she wrote, perhaps seeking to head off her survivors' inevitable questions. "The more it tells you the less you know." Since her untimely death in 1971, the barrage of posthumous projects has continued unabated to the present. It began almost immediately in 1972 with the Venice Biennale and her breakout show at MoMA — accompanied by the best-selling photography monograph of all time. The analysis is capped, at least for now, by Arthur Lubow's recent biography, Portrait Of A Photographer published in June. Strewn in the forty-four year gap have been a slew of biographies, films, monographs, and essays. At this point there's been enough speculation that the critical realm may feel saturated. But the latest collection of her photographs, diane arbus: in the beginning (title in lowercase, just like her famous monograph), offers a fresh angle. No matter how well you think you know Arbus, these photographs will give you something new to consider. 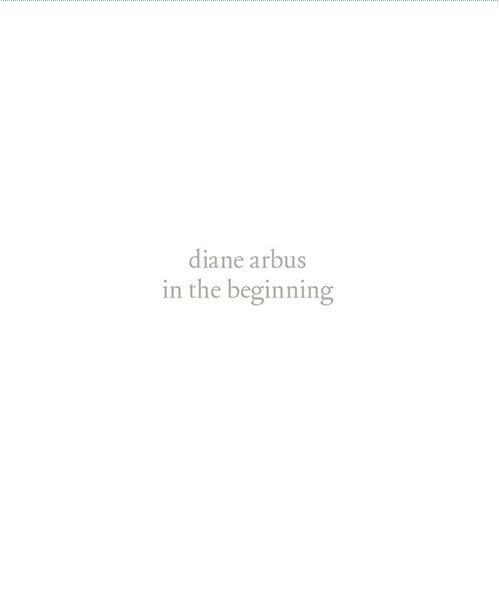 diane arbus: in the beginning. By Diane Arbus. Yale University Press, 2016. Arbus made her reputation with a singular, penetrating style of portraiture unlike any before or since. Under the tutelage of Lisette Model and others, her photographic voice developed in the early 1960s, Arbus's late thirties. By the time she'd reached forty her creative vision was at full strength, where it remained until her death at 48. Using b/w film and a waist-finder Rollei, she sought out the psychological cracks in her subjects, often aided by flash, creating a photographic style which is recognizable even four decades later: direct, quirky, invasive, maybe a shade cruel. To date almost all critical attention has focused on this style and this period. This is because her oeuvre has been carefully controlled by her estate, and because, well, it's her best work. It turns out those photographs —the ones made famous in her first monograph— are only part of the story. Roughly half the prints produced by Arbus during her life were from an earlier period, roughly 1956 - 1962. She was 33 in 1956, drifting away from her husband and their studio profession, ready for the whatever the next adventure was. That year she began prowling New York with her Nikon, archiving film, and making prints. She made thousands, but they remained tucked away unnoticed in a corner of her darkroom for almost a decade after her death. They were discovered and stored by her estate. Nothing much happened to them until 2007 when they were acquired by New York's Metropolitan Museum of Art, a suitable home for someone so closely associated with the city. Under the direction of Karan Rinaldo, the museum began the long process of recording, categorizing, and making sense of them. The product of their efforts is in the beginning. A large exhibition of the prints is currently at Met Breuer. In conjunction with the show, a handsome hardback catalog was published in July. Arbus was a careful record keeper and labeled each roll of film consecutively, beginning with #1 in 1956 and continuing forward to 1971. This methodology —shared by many photographers— is inherently diaristic and biographical. The Met wisely sequenced the book in order of the negatives. After all, it's Arbus's development that most will be concerned with here. How did she gain her visual power? What was her path? Viewing her photographs chronologically allows the reader a direct view into her evolution. Her learning curve over the six year period is steep and irrepressible, almost like an image forming in a developing tray: slow, steady, and magical. The book's early photographs look like those of any beginning street shooter. They are quick captures in public settings focused on people. But she wasn't a typical street shooter. "The subject is always more important than the picture," was her philosophy, a direct rebuttal to Winogrand's "photograph to see what something looks like photographed". Her main subject was always people, their quirks, habits, and secrets. As the book progresses, the reader sees her curiosity and voyeurism bloom in equal measure. Her gaze begins to penetrate, and her photos begin to bite. A photograph of a couple in a cab staring back seems a version of self portrait. A later photo of a man holding a paper bag reveals increasing mastery over her interactions, and her sense of composition. Her camera wasn't yet a live grenade, but getting there. By the late 1950s she was no longer wandering casually, but instead meeting the theatrical halfway, seeking out cinema, vaudeville, performers, and stagehands. "My favorite thing is to go where I've never been," she said, and the city was full of such places. As the book progresses her photos assume a flavor of insatiability. Even plain photographs of movie interiors without any central figure convey a sense of someone always looking, always ready to shoot. By 1960 her photographs began to show trappings of private settings, revealing a degree of pre-arrangement and exploration which would come to true fruition in her later work. She'd found her calling, and it required immersion into the orbits of her subjects. As Jeff Rosenheim describes her transition in the afterword, "Arbus' role as curious outsider receded over time in favor of a privileged —[if only provisional— ] insider." She'd learned to gain entree, but she needed to keep moving. The book covers her progression in a surehanded way, with just the write mix of experimental photographs and clear development markers. It's visual chronology with an arc. The final image in the books' main sequence is from 1962. This is the Xmas Tree from Levittown photograph (original date corrected) which originally appeared in the 1972 monograph. At this point she'd made the switch to medium format, injected a wry comment on social mores, and left the training wheels behind. She was primed to become a giant in the photo world.